Amazon Customer Review : I use this book as a primary refernce tool in my life. THe information here is historical and informative. Green Tea is a life saving, life enhancing and life giving drink that goes un noticed buy many. Summary : If you love pure green tea, it will be hard to see how you will not like this light and subtle tea. Definintely not your garden variety "chinese restaurant green tea." Review : Earlier today, I had a very unpleasant tea tasting experience in the form of Stash Green Tea, a true "cheap chinese restaurant tea" if there ever was one. As such, I was looking very forward to giving the Dragonwell Green Tea from Adagio Teas a try. I love the name of this tea...Dragonwell. Dragonwell is actually one of the most popular green teas in China. This type of tea also goes by the name of Long Jing, so don't let conflicting names confuse you. Like other dragonwell green teas, the leaves of this tea are flat. And like other teas from Adagio Teas, the leaves of this tea are very, very high quality. Here is how Adagio Teas explains this tea on their website : "Green tea from the Chinese village of Dragon Well (Lung Ching in local parlance). Dragon Well tea has a distinguished shape. Its leaves are broad and flat, a result of laborious drying. There is something to show for this hard work: Dragon Well tea is refreshingly smooth, sweet and delicate, among the very best of Chinese greens. Our 'Dragon Well Requiem' is a First Grade version of this truly sublime tea.."
Make no mistake. This tea is a "pure green tea." Nothing has been added. No scents. No flavors. No infusions. Just pure green tea. Now, some people probably will not like this tea for that simple reason. And that's fine. But for those poor people who have had their taste buds destroyed by cheap green tea at chinese restaurants, I urge you to keep a open mind with this tea. It is far better than any bagged restaurant tea you will find...with a much more powerful taste with no bitterness (just be careful to not oversteep the tea!). Recommendation : Yes. This is a great high quality "pure green tea." If you hate pure green teas in all form, then I suspect you won't like this one either. But other than that, if you have been wanting to try and pure green tea and don't know where to start...this tea from Adagio Teas makes a great place to start. Brewing Instructions : Pour 6 ounces water that has a temperature of 180 degrees (not boiling! 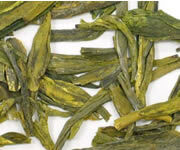 ), over about 1.25 teaspoons of green tea leaves. You want to use more than 1 teaspoon of leaves with this tea because the leaves are quite large (which throws off precise teaspoon measurements). Let steep for 3 minutes.